Marxism is the name for a set of political and economic ideas. The base of these ideas comes from the works of Karl Marx and Friedrich Engels. They have had a lot of influence in many countries. Marxism influenced other political views, such as social democracy and reformist socialism. Both believe that the ideas of Marx and Engels can be achieved through what Marx called 'bourgeois democracy'. People disagree a lot on how a Marxist society should be organised: "Marxist political economists differ over their definitions of capitalism, socialism and communism. These differences are so fundamental, the arguments among... Marxist political economists have sometimes been as intense as their oppositions to... capitalism". Marxism says that people in the world are organized into different groups, or classes, based on what they do for work. Most people are called "workers" because they work in factories, offices, or farms for money. They belong to the "working class" (or "proletariat"). Another group, who are not as big as the working class, are "capitalists" (or "bourgeoisie"). They own the factories, land, and buildings that the workers have to work in. They also own all of the tools the workers have to use. Marx calls capitalists the "Ruling Class" because they live off of the work of all the workers. He also says that the capitalists own the government, army, and courts. In Marxist views, Capital is the "means of production" and money which the capitalist can invest in different places of business, so that they can "profit" or gain more Capital. Here is an example of exploitation of labor. Jane is a shoemaker. She works for Michael, who owns a shoe factory that can make 60 pairs of shoes in a day. Jane makes 60 pairs of shoes every day. Michael pays Jane $20 a day. However, Michael sells each pair of shoes for $2 each. This means he makes $120 in a day. After he pays Jane her $20 wage, Michael has $100 left over. However he then has to pay for materials which cost $1 for each pair, so that's $60 each day. Then running expenses of the factory cost him $10 a day. So he only gets $30 at the end of the day for managing the business. This remaining wealth is called "Profit" or "Surplus [extra] Value." In other words, even though Jane makes 60 shoes every day, she only gets paid the value of 10 pairs of shoes. The rest of the day, while she is making the other 50 shoes, she is creating money for her boss. Her labor is making him richer and helping him earn money. It is this Surplus Value, or Profit, which Marxism thinks as an exploitation of labor. This exploitation allows the smaller class (capitalists) to live without working, while the bigger class (the workers) have to work for the capitalists to survive. Marxism says that factories, tools, and work places cannot create new value on their own. They are like a blueberry bush: it has no value on its own. People have to create that value by laboring. For example, someone spends a day picking blueberries. Those blueberries can now be traded or eaten because of the labor that was put in to pick them. Marxist thinking claims that capitalists and workers are constantly struggling. They call this "Dialectical Materialism." This is the idea that the history of humans is the history of conflict between classes. Different classes with different interests argue or fight each other. Social change (or in its absence: social stagnation) is the result. Marxism says that capitalists want to exploit the workers as much as possible, and make their pay as low as they can. The capitalists do this, to create as much profit for themselves as possible, as quickly as possible. Workers, on the other hand, have to struggle to keep their wages up, and to keep the "rate of exploitation" low, so that they can live more peaceful lives. This is what Marxism calls "Class Struggle": where workers and their bosses fight against each other to gain for themselves. Marxists think that all of written human history has been divided by economic classes. One example is feudal society (a medieval society controlled by feudal Lords and Nobles). The ruling class got their power and wealth from the labor of peasants (farmers). But, as peasants demanded more and more for themselves, small shopkeepers and tradespeople began to appear. Many of these people formed guilds as well, and eventually began to employ workers. These workers were able to gain wealth for themselves at these jobs. These historical events created capitalism. In this way, Marxists think that history has been pushed forward by class struggle. They think that change will be born from this struggle, just like capitalism was. However, they also think that capitalism will give way to communism, as the workers' struggle becomes more and more revolutionary. The core of Marxist thinking is called Materialism. Materialism is a philosophical view that says that communities develop from the "ground up". It says that the "higher" qualities of culture (like art, manners, customs, and religions) are actually founded on the "lower" or simpler qualities of life. These qualities include having enough of what people need to survive, like food and shelter; who has money and what they have to do to get it; who is allowed to work, and who is forced to work. Changes in the higher qualities of culture (sometimes called the "Superstructure") are often linked to changes in the lower qualities of life (sometimes called the "Base"). One example is that in medieval times, people thought "honor" or duty to people with more power than them was very important. Today, in Western countries, many people see ambition (being someone who works hard for their own goals) as more important. This is because in medieval times, people worked their entire lives under lords who depended on them not only for work but for war. Today, people work for themselves more, and our society lets some people move up from being poor to being rich. In this case, what people see as good and important depends on how the rulers get value out of their workers. Marxism recognizes that in earlier time periods, we lived first under rulers who owned everything. Then we lived under lords who owned land with workers who lived and worked on that land. In Marx's time, people lived under governments that allowed many people to own property. Eventually, Marxists believe that we will move to a society where everyone owns everything in common. This will be called socialism. In other words, human society has always been based on the economic forces (such as x and y) that human beings can control. For Marxism, this means that each society would take its form based on its "mode of production." Marxists believe that humans' ability to produce goods and services today, means people can move beyond the conflicts of a society that is divided into classes. Many Marxists believe that there will always be revolts and, with the right conditions, revolutions. In these revolutions, the workers will fight the capitalists. If they win, during this process, they will set up a socialist "workers' state" (a form of government where the workers are the rulers of society). This (which?) state will only be temporary. Its job will be to take power away from the capitalists, until all the capitalist countries in the world are defeated, and social classes no longer exist. Marxists believe that if the working class makes itself the ruling class, and destroys the basis for class society (private property, or what Marx called "Bourgeois Property"), there will be a "classless society." In a Marxist society, no social classes are in conflict, and there is no government anymore. The state will no longer be needed. There would be no countries. The world will have no borders. There will be communes around the world. Workers will organise production of goods and services based on what people need, not based on profits. Some Marxists say that modern "communism" is not communism at all. They say that "communist" countries like the Soviet Union, the People's Republic of China, Cuba, and Vietnam are really using different forms of capitalism, often with heavily "nationalized" industries. A thinker named Tony Cliff was one of the biggest supporters of these ideas. He wrote that states like the Soviet Union and Communist China (before 1980) were "State-Capitalist." People use these terms interchangeably (even in this article). This is incorrect. These concepts do not have the same meanings. Marxism is a political and economic way of organizing society, where the workers own the means of production, and there is no government. Socialism is a way of organizing a society in which the means of production are owned and controlled by the proletariat. Marx proposed that this was the next necessary step in the progress of history. Communism is the theoretical classless, stateless society that Marx proposed would arise after Socialism. Lenin, Vladimir (1967) . 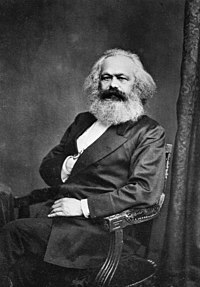 Karl Marx: a brief biographical sketch with an exposition of Marxism. Peking: Foreign Languages Press. Retrieved 2014-06-17. Prychitko, David L. (2008). "Marxism". In David R. Henderson (ed.). Concise Encyclopedia of Economics (2nd ed.). Library of Economics and Liberty. This page was last changed on 11 January 2019, at 14:27.